Echinococcosis or hydatid disease is a zoonotic parasitic disease caused by larval stage of cestode Echinococcus granulosus. It is endemic in sheep rearing areas with high prevalence in China, Central Asia, the Middle East, Eastern Africa, Australia, New Zealand, Alaska, and some parts of South America., Dog is the definitive hosts while sheep is the usual intermediate host. Humans are accidental intermediate dead end hosts infected through ingestion of parasite eggs in contaminated food, water or soil, or through direct contact with animal hosts. After gaining entry in gut the parasite larva penetrates the duodenal mucosa, reaches the blood stream, and seeds the liver and lungs commonly. The cysts are most commonly located in liver (75%) followed by lungs (15%). Primary or isolated involvement of kidneys is rare and accounts for 1%–5% of all hydatid disease in humans., Most patients with primary involvement of kidney remain asymptomatic for years altogether. In those symptomatic, they are nonspecific and subtle, such as low backache (40%) and upper abdominal discomfort (20%). The only definitive diagnostic sign is the presence of daughter vesicles in the urine seen in 10% cases. The treatment is surgical as simple aspiration is associated with very high recurrence rates (90%). Total or partial nephrectomy is recommended with cyst rupture into the collecting system or outside and infection. A 50-year-old female reported to nephrology outpatient department with complaints of the right upper abdominal discomfort of 6 months duration. The pain was dull aching type with no radiation elsewhere. There was a history of intermittent hematuria with the abdominal discomfort. There was no history of colicky abdominal pain, lithuria, weight loss, anorexia, or jaundice in the past. She was postmenopausal with none significant medical or surgical history. She hailed from a remote village in central India and was sheep rearer by occupation. She consumed mixed diet and belonged to low socioeconomic strata. General examination revealed palor while on abdominal examination right kidney was palpable with bosselated surface and was nontender. There was no renal angle tenderness or hepatosplenomegaly. Complete hemogram showed anemia (hemoglobin - 6.5 g/dl) with normal leucocyte and platelet count. Her renal and liver function test was normal. An ultrasound examination of abdomen and pelvis showed a multiloculated cystic lesion of size 6 cm × 7 cm × 13 cm size with daughter cysts in the right kidney. Other viscera were found to be normal. The patient was hospitalized and transfused two units of blood. After adequate hydration, she was subjected to contrast-enhanced computed tomography of abdomen. It showed a well-defined multilocular peripherally enhancing cystic lesion with mixed internal attenuation and peripherally arranged daughter cysts and curvilinear calcification [Figure 1]. The cystic lesion replaced almost entire right kidney causing enlargement and architectural distortion measuring 5.5 cm × 7 cm × 13.5 cm with no contrast excretion. Rest of the examination was normal. Serology was not done due to nonavailability at our center. A final diagnosis of primary right renal hydatid cyst was arrived at. The patient was started on tablet albendazole 10 mg/kg/day in two divided doses with fatty meal and hematinics. Urology consultation was sought, and the patient was explained about the need of right total nephrectomy in view of nonfunctioning right kidney. The patient was discharged and later admitted after 4 weeks of oral albendazole therapy. Extraperitoneal right nephrectomy was performed. Specimen showed a large thick walled cyst with numerous daughters' cysts in the kidney [Figure 2]. Gross examination of the nephrectomy specimen showed chalky white external surface of kidney with distorted calyces. Multiple cystic cavities with attached cyst wall were noted. Multiple pearly white tissues contained gelatinous material suggestive of hydatid cysts. Histopathologic examination showed sclerosed glomeruli, thyroidization of tubules and thickened arterioles. There was marked chronic inflammatory infiltrate in the interstitium including eosinophils, lymphocytes, and giant cells. Cysts specimens showed scolices with hooklets and thus final diagnosis of hydatid cyst with chronic pyelonephritis was arrived. The patient was discharged on day 5 after an uneventful postoperative course. Oral albendazole was continued for another 4 weeks on discharge. The patient is on regular follow-up in outpatient department in health and normal renal function test. Primary renal hydatid cyst is caused by ingestion of the parasite eggs in contaminated food, water or soil, or through direct contact with animal hosts. It crosses duodenal mucosa invasion, and renal cyst is due to hematogenous spread. Our patient was a sheep herder and was in direct contact with sheep and dogs. Renal hydatid is rare compared to liver and lung hydatid cyst and is a challenging condition to diagnose owing to the absence of specific signs or symptoms. Presenting symptoms are variable, and the most common symptoms are palpable mass, flank pain, hematuria, passing of pearly structure in urine, malaise, and fever., Our patient had a history of vague abdominal discomfort with intermittent hematuria. Serology is less helpful in diagnosis due to high false negative results but is a useful epidemiological tool to monitor transmission and initiate control measures. Imaging plays the key role in diagnosing and staging of renal hydatid cyst. Ultrasound is the most essential tool for diagnosis of hydatid disease demonstrating floating membranes, daughter cysts, and hydatid sand seen in pure cystic lesions. The WHO/IWG-E – 2010 classification system for cystic echinococcosis (CE) diagnosis and treatment is based on ultrasound imaging and classifies hydatid cysts as stage active (CL, CE1, CE2), transitional (CE3a, CE3b), and inactive (CE4, or CE5)., Computed tomogram is superior to other imaging modalities in being more sensitive in observing daughter cysts, minute calcifications, intracystic gas, and in anatomical localization preoperatively. The treatment of hydatid cyst of the kidney is based on the WHO/IWG-E – 2010 classification system for CE. Active and transitional lesions need surgical intervention/percutaneous aspiration injection and reaspiration (PAIR) + medical management due high infectivity and risk of spread. Inactive lesions needs monitoring. PAIR has high failure rates and risk of peritoneal seeding and hence avoided. Surgical modality includes extraperitoneal and laparoscopic partial or total nephrectomy. Laparoscopic nephrectomy entails risk of cyst rupture, dissemination, and incomplete removal of the hydatid cyst. Extraperitoneal nephrectomy is favored which is devoid of above risks. It is preceded by cystectomy where first the cyst is punctured; content aspirated then filled with scolicidal like hydrogen peroxide or 10% povidone-iodine for 5 min. This maneuver reduces the internal pressure of the cyst, sterilizes the content, and allows next step of controlled opening of the cyst and its controlled evacuation with a spoon and germinate membrane removal. Complete nephrectomy is reserved for destroyed nonfunctioning kidneys, opening into the draining system or other cavities and complicated by renal infection. Medical management is recommended with bi-imidazoles like albendazole (10–15 mg/kg/day in two divided doses) or mebendazole (40 mg/kg/day in three divided doses) in combination with PAIR procedure in inoperable cases. Preoperative three cycles bi-imidazoles of 4 weeks duration 2 weeks apart makes the cysts less tense preventing spillage and anaphylaxis. Postnephrectomy 3 months course of albendazole can prevent recurrences. Primary renal echinococcosis or hydatid cyst is rare and can be easily missed out due to nonspecific manifestations. A low threshold of using ultrasound in centers catering high-risk group prone for echinococcosis is desired for early diagnosis. Surgical management with pre- and post-operative bi-imidazolines has good outcomes with lesser recurrence rates. Gögüs C, Safak M, Baltaci S, Türkölmez K. Isolated renal hydatidosis: Experience with 20 cases. J Urol 2003;169:186-9. Rexiati M, Mutalifu A, Azhati B, Wang W, Yang H, Sheyhedin I, et al. Diagnosis and surgical treatment of renal hydatid disease: A retrospective analysis of 30 cases. PLoS One 2014;9:e96602. Horchani A, Nouira Y, Kbaier I, Attyaoui F, Zribi AS. 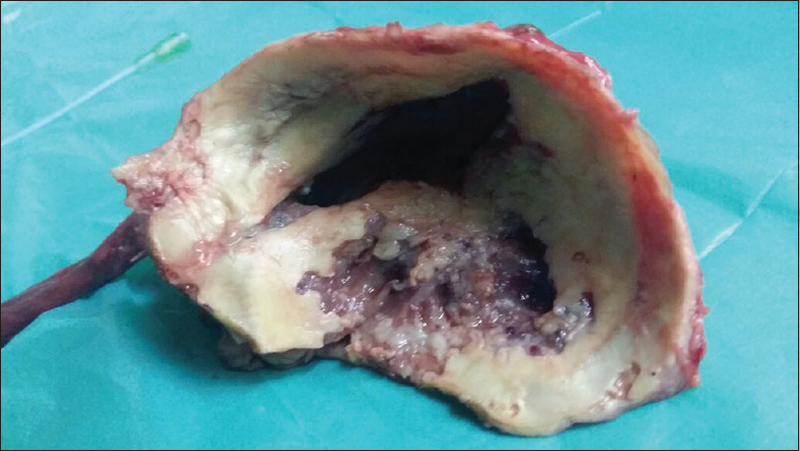 Hydatid cyst of the kidney: A report of147 controlled cases. Eur Urol 2000;33:461-7. Zmerli S, Ayed M, Horchani A, Chami I, El Ouakdi M, Ben Slama MR. Hydatid cyst of the kidney: Diagnosis and treatment. World J Surg 2001;25:68-74. 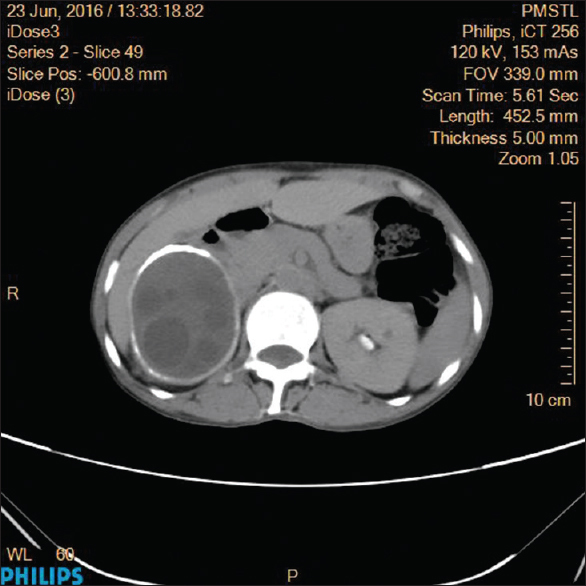 Shukla S, Singh SK, Pujani M. Multiple disseminated abdominal hydatidosis presenting with gross hydatiduria: A rare case report. Indian J Pathol Microbiol 2009;52:213-4. Ohkawa M, Tokunaga S, Orito M, Shimamura M, Hirano S, Okasho A, et al. Percutaneous injection sclerotherapy with minocycline hydrochloride for simple renal cysts. Int Urol Nephrol 1993;25:37-43. Yilmaz Y, Kosem M, Ceylan K, Koeoglu B, Yalcıinkaya I, Arslan H, et al. Ourexperience in eight case with urinary hydatid disease: A series of 327 cases held in nine different clinics. Int J Urol 2006;13:1162-5. Yang YR, Craig PS, Vuitton DA, Williams GM, Sun T, Liu TX, et al. Serological prevalence of echinococcosis and risk factors for infection among children in rural communities of Southern Ningxia, China. Trop Med Int Health 2008;13:1086-94. Brunetti E, Kern P, Vuitton DA; Writing Panel for the WHO-IWGE. Expert consensus for the diagnosis and treatment of cystic and alveolar echinococcosis in humans. Acta Trop 2010;114:1-16. Basiri A, Nadjafi-Semnani M, Nooralizadeh A. Case report: Laparoscopic partial nephrectomy for isolated renal hydatid disease. J Endourol 2006;20:24-6. Junghanss T, da Silva AM, Horton J, Chiodini PL, Brunetti E. Clinical management of cystic echinococcosis: State of the art, problems, and perspectives. Am J Trop Med Hyg 2008;79:301-11.